This thread has been around for a long time. It was first formulated in 1884 and was standardised in 1903. Mainly found in electrical fittings and accessories, it is slowly being replaced by ISO metric. 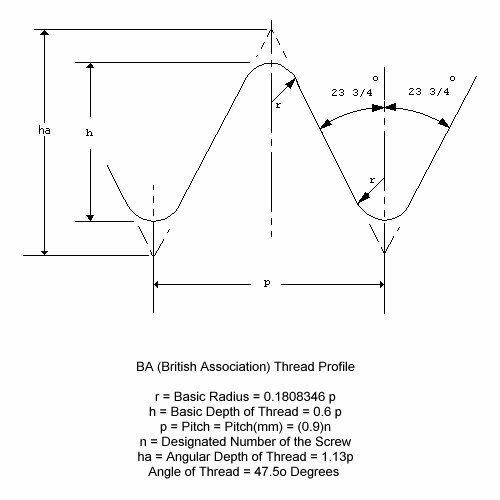 47-1/2 degree thread angle. This is a metric thread system devised by the British for small screws used in components like speedos. Not metric like you might expect, but with diameters determined by a factor proportional to a power of the logarithm to the base 10 of the thread pitch in millimeters. You'll find lots of BA threads on any British car, but only for fasteners smaller than 1/4". BA fasteners have their own set of spanner sizes. Typically, a set of "Whitworth" sockets will include a OBA (and maybe a 2BA--bigger number = smaller size) socket.